Riverwalk at Loon Mountain successfully combines Old World elegance with an array of modern conveniences. This new, full-service timeshare resort in the midst of the White Mountains has everything travelers need to ensure a spectacular getaway for all ages. Buy a New Hampshire timeshare to take in this extraordinary experience for yourself. This stylish property is located in the center of Lincoln, New Hampshire. Accordingly, guests have excellent access to restaurants, shops and entertainment. The brand new South Peak Expansion on Loon Mountain is directly behind the resort, which means that skiing and hiking adventures are always convenient. As a four-season destination, guests will find a great deal to explore throughout the year. An indoor, heated pool is open year round while the outdoor pool becomes a festive skating rink in the winter. Hot tubs are located both indoors and out. At the La Vista Restaurant & Bar, diners enjoy superlative authentic Italian cuisine. The property also boasts its proprietary Seven Birches Winery. A trip to the tasting room is an absolute must. Guests stay in shape in the fitness room, take advantage of the adventure concierge and indulge in luxurious spa treatments. Accommodations range from studios to three-bedroom condominiums. The resort is seven stories tall, and a variety of floor plans are available. Studios are much like a deluxe hotel room, complete with full kitchen. Condominium-style accommodations boast private sleeping quarters and large common areas. The most deluxe rooms feature a spacious balcony that offers views of the mountains or the nearby river. With elegant yet laid-back décor, upscale linens and luxurious beds, these rooms promise a relaxing stay. Riverwalk at Loon Mountain is a new resort in an historic setting. 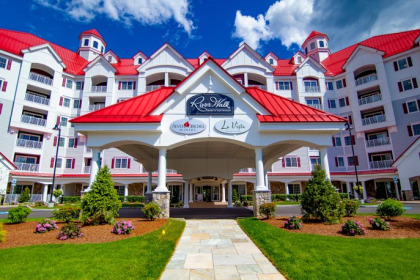 If you are ready to enjoy a mountain vacation in stylish surroundings, then give New Hampshire timeshare resales a try. Contact RiverWalk at Loon Mountain Specialist Today!